Victoria, located on the southern tip of Vancouver Island, 63 km (39 miles) south of Vancouver, is considered one of the most beautiful cities in the world. The capital of British Columbia, Victoria is world famous for its beautiful Empress Hotel, Parliament buildings and gardens. A visit to Vancouver is not complete without a trip to Victoria. And a visit to Victoria is not complete without a tour to the world renowned Butchart Gardens. The Victoria and Butchart Gardens Tour price includes hotel pick up and drop off, ferry crossing in both directions, all transportation, tax and admissions. On your return ferry trip, a buffet dinner is available with excellent food and spectacular views of the lights of the islands and mainland. Book Now or Email us or call 604-990-9299 or 800-913-9207 for more information and reservations. Ferry ride to Vancouver Island: Enjoy a 90 minute ferry cruise through the spectacular Gulf Islands en route to Victoria. Watch for whales, sea lions and bald eagles. Breakfast is available on the ferry ride to Swartz Bay where the Victoria ferry lands on the island. 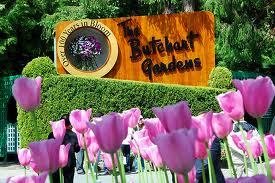 Butchart Gardens: In 1904, Jenny Butchart began to beautify a worked-out quarry site near Victoria, BC. The quarry site was the gash in the earth left over from her husband’s portland cement operation. Today Butchart Gardens is fifty-five acres of flowers, trees, pathways and creeks. Featuring a sunken garden, a world famous rose garden and a wonderful restaurant serving High Tea daily, Butchart Gardens is one of the most beautiful and best maintained gardens in the world. Downtown Victoria: Tour the city and take a scenic drive along the coast and enjoy the views. Ride through the famous Oak Bay and Uplands residential areas plus the University of Victoria, Beacon Hill Park, Chinatown and Downtown. Free Time: Enjoy time in Victoria to browse, visit the Royal British Columbia Museum with its North West Coast Native art, the Parliament Buildings and the Empress Hotel.